The challenge designer Sue McCann, Henry Kitchen & Bath, faced in this new home was taking a large space and making it functional and easy to work in. Separating the refrigerator and cooktop areas keep the cook separate from the family going to the refrigerator. The prep sink and main sink face one another for a fun atmosphere when two cooks are working in the kitchen. 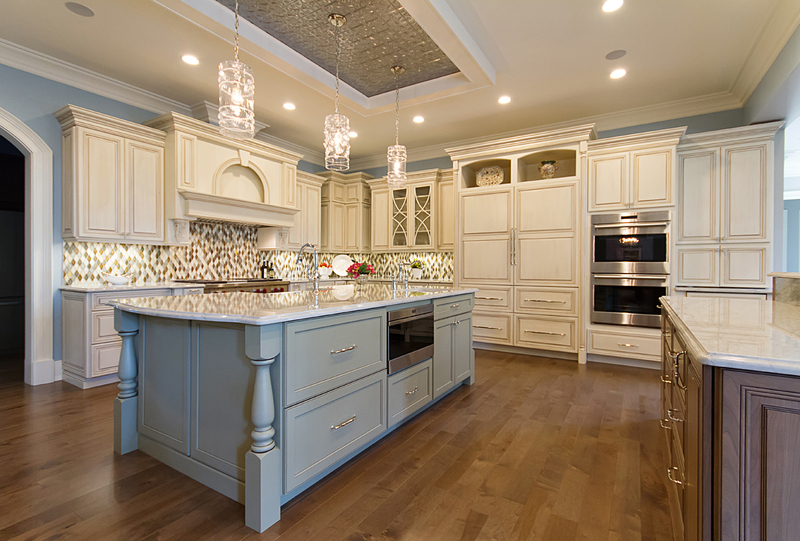 To give the space a fun and elegant look, McCann chose several cabinetry options. For the main perimeter, the cabinets are maple pearl with a cognac glaze. The prep island is done in maple with a pesto paint and coffee glaze, while the entertaining island is cherry with a riverbed stain. The second island is convenient for entertaining and homework time and coordinates with the formal wet bar just across the room. McCann also used a mixture of legs and corbels to give variety to the large amount of cabinetry used. With high ceilings and no windows in the kitchen, the space still feels light and bright. Sea-pearl quartzite countertops and Hirsch glass tile bring a fresh, modern look to the traditional wood details. For a warm and interesting look, a tin-ceiling detail was added to the coffer above the prep island. This kitchen accommodates the family really well and is light and bright with no windows. The tin ceiling is unique and breaks up the large space. The gray color of the island gives a nice contrast to the space.